Did the Nazis use wire-mesh columns to pour Zyklon-B into the gas chambers at Auschwitz-Birkenau? Camp construction records say nothing about the existence of wire-mesh introduction columns, located under the holes in the roofs, which were used to distribute the poison gas throughout the gas chamber room. The wire-mesh introduction columns cannot be found today. 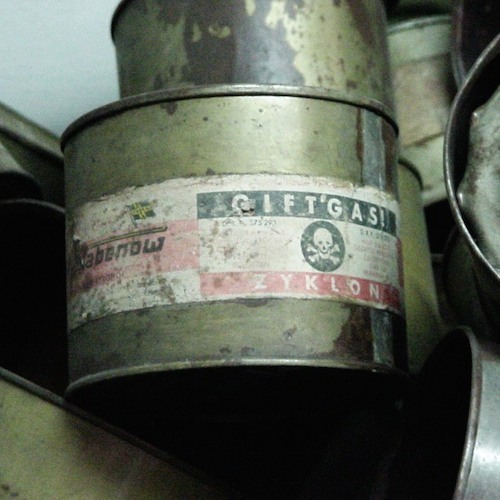 The Nazis dismantled and discarded them before blowing up the gas chambers. The Nazis did this to erase the evidence of genocide. However, the wire-mesh introduction columns are confirmed by multiple survivor and perpetrator eyewitness accounts, as well as by a surviving document that lists them in inventory. The walls of the underground gas chamber room extended a few feet above ground, similar to the foundation of a house with a basement. The flat roof over the foundation walls was banked up with dirt around the edges which made it easy for the SS men to climb onto the low roof and walk from chimney to chimney with cans of Zyklon-B. Inside the gas chamber rooms in Cremas/Gas Chambers 2 and 3 and beneath the holes in the roof, there were hollow wire-mesh introduction columns that extended from the ceiling to the floor. These columns contained the Zyklon-B pellets and permitted the even distribution of the gas throughout the entire room. Three survivors and one Nazi perpetrator testified about the construction and installation of the wire-mesh columns. Michal Kula, a prisoner at Auschwitz-Birkenau, worked in the metal workshop where he helped build the wire-mesh introduction columns. He described the wire-mesh introduction columns in detail. Each column was made of three wire screens nested one within the other. The core of the inner column contained a collection basket for the used pellets so they could be lifted back to the roof for disposal. David Olère, a Jewish French artist before the war, was arrested and sent to Auschwitz-Birkenau in March 1943. He was assigned to the Sonderkommando of Crema/Gas Chamber 3. He lived in the attic of that building and observed its operations on a daily basis. In 1945 and 1946 he drew a series of 50 pictures of what he had seen in Birkenau. In a cutaway elevation of Crema/Gas Chamber 3, Olère shows the four wire-mesh introduction columns. They are identified in the lettered key as “Grille pour Bombes a Gaz” (Gas Introduction Columns). In addition to multiple eyewitness testimonies, there is also primary documentary evidence about the wire-mesh introduction columns. By Michael Hanke – Own work, CC BY-SA 3.0, [https://commons.wikimedia.org/w/index.php?curid=129339]. The wire-mesh columns cannot be found today because they were dismantled and discarded before the Nazis blew up the cremas/gas chamber buildings. However, the existence and function of the wire-mesh introduction columns is corroborated by multiple survivor and perpetrator eyewitness accounts as well as by a surviving Nazi inventory list. Brian Renk, “Convergence or Divergence? On Recent Evidence for Zyklon Induction Holes at Auschwitz-Birkenau Crematory II” at http://www.ihr.org/jhr/v20/v20n5p33_Renk.html. Yisrael Gutman and Michael Berenbaum, Anatomy of the Auschwitz Death Camp (United States Holocaust Memorial Museum/Indiana University Press, 1994), p. 167. See also David Olère’s floor plan of Crema 2 on page 174 of Robert Jan van Pelt, The Case for Auschwitz: Evidence from the Irving Trial (Indiana University Press, 2002), for an modern architectural rendering of Crema 2 showing the four wire-mesh introduction columns, see p.190; and for an axonometric reconstruction (modern) of the gas chamber room in Crema 2 see p.194. Robert Jan van Pelt, The Van Pelt Report (“IV Attestations, 1945-46”) at https://www.hdot.org. Robert Jan van Pelt, The Case for Auschwitz: Evidence from the Irving Trial (Indiana University Press, 2002), pp. 176-177. Olère made his drawings immediately after the war. The sketches ended up in Israel after the war and their existence was unknown before 1976. Robert Jan van Pelt, The Van Pelt Report (“IV Attestations, 1945-46”). You can read about Tauber’s testimony at http://holocaustcontroversies.blogspot.com/2010/01/how-carlo-mattogno-distorted-henryk.html. It was detailed in Jean-Claude Pressac’s Auschwitz: Technique and Operation of the Gas Chambers (Beate Klarsfeld Foundation, New York, 1989). Robert Jan van Pelt, The Van Pelt Report, (“V Confessions, 1945-1947”) at https://www.hdot.org; Rudolph Höss, Death Dealer: The Memoirs of the SS Kommandant at Auschwitz (Prometheus Books, 1992), p. 31. Robert Jan van Pelt, The Case for Auschwitz: Evidence from the Irving Trial (Indiana University Press, 2002), p. 370. Robert Jan van Pelt, The Case for Auschwitz: Evidence from the Irving Trial (Indiana University Press, 2002), p. 401.